Breitbart London editor Raheem Kassam has been suspended from tweeting using his Twitter account for a week following a stream of online abuse aimed at him by hard-left activists. Following an interview with Paul Joseph Watson on the issue of no go zones, Kassam was sent streams of abuse by anti-Brexit, anti-Trump Twitter users @snigskitchen, @sarahjwait, and other, anonymous users. 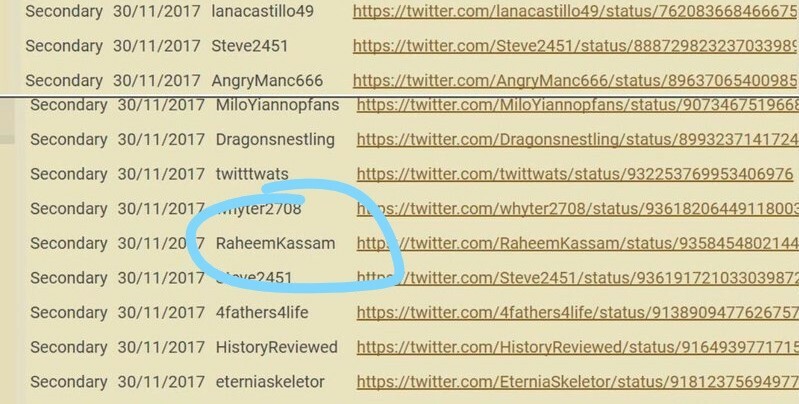 The action comes after Kassam was revealed to be on a “hitlist” of Twitter users promoted by far-left wing account “@ResistingHate” bragging they were able to get right-wing Twitter users banned by mass reporting accounts. User @sarahjwait tweeted at Kassam earlier Wednesday morning demanding he stop tagging her in messages, despite jumping into one of his conversations with a stream of abuse aimed at the Breitbart Editor. When this was pointed out to her, she began mass blocking the accounts highlighting her hypocrisy, including that of Breitbart London assistant editor Jack Montgomery. Instead of blocking or muting Kassam however, Ms. Wait began repeatedly tagging Twitter’s support account and founder Jack Dorsey in her tweets, at one point threatening legal action against Kassam, leading to his response — cited by Twitter as in violation of the service’s rules — insisting he would counter-sue for vexatious claims. You have the gall to complain about @RaheemKassam abusing you then you retweet stuff like this about him. 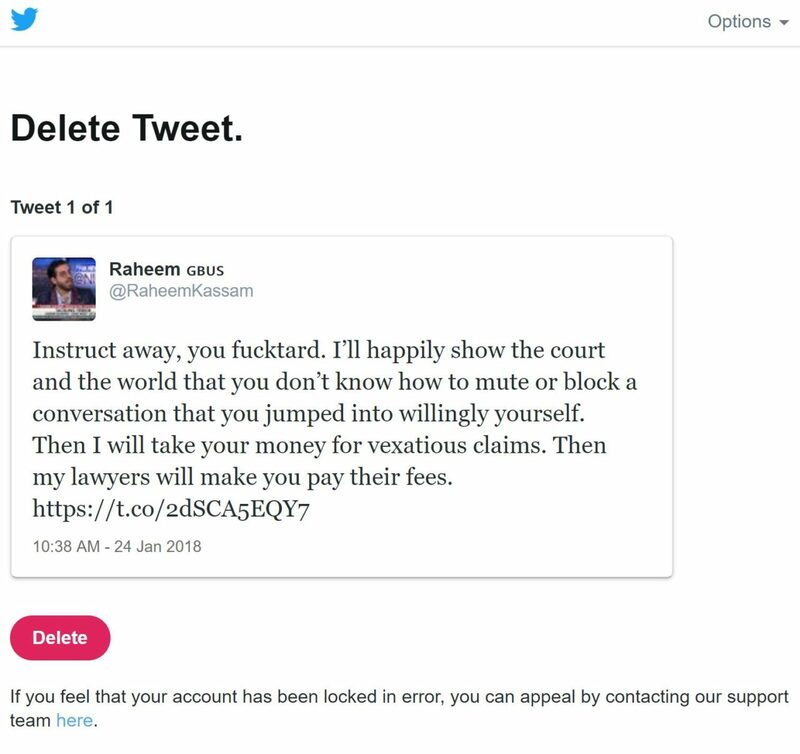 Twitter demanded Kassam delete the tweet to regain access to the account, only afterwards revealing the account would be block for seven more days. It is unclear which terms of service Twitter is alleging have been breached with the tweet, and at the time of publication, the company had not responded to a request for clarification. Kassam joins a long list of conservatives suspended or blocked by the struggling tech giant, which recently took another knock in its credibility after a Project Veritas investigation revealed left-wing operatives inside the organisation bragged about reading people’s direct messages, shadowbanning conservatives, and more. The targeted attacks on Kassam come shortly after his viral Sky News appearance, where he alleged that London mayor Sadiq Khan was turning Britain’s capital into a “sh*thole”. The video of the interview has had over five million views across multiple platforms — including Twitter — in recent weeks. Kassam’s account can still be followed, here, though he is unable to tweet for seven days.